Each puppy is an amazing experience. You roll your dice and take home your little bundle, completely unaware of what's really inside this furball. The roller coaster ride your to dog's grown-up personality has begun. Sometimes you yell "WHEEEEEE" and sometimes you cover your eyes and hope for the best. cocoa-colored morsel was handed to me while Emma looked on with a maternal gleam in her eye and Arthur stared out a doorwall, deep in denial. As we talked and inhaled his sweet puppy odors, Duncan began to make the oddest moaning sound. Finally a little neuron fired and I set him back in his puppy pen where he proceeded to dump about 2 quarts of urine on the newspaper. All the while, he was looking at me like I was the village idiot for taking so long to figure out what he wanted. Yes, this boydog was a communicator - subtle yet insistent. We traded him for mere money and drove away. The ride home had its share of thrills. We stopped for a drive up lunch and got a cup of water for the dogs. The cup was not big enough for two muzzles at a time. Emma made this clear to Arthur by biting his nose when it entered the cup. Duncan watched with calm fascination as we scolded Emma and mopped Arthur's bleeding nostril. A few hours later, hypnotized by the road, I stopped at an antique mall to stretch my legs and get a change of pace before I fell asleep at the wheel. Papa and the dogs were snoozing in the air conditioned car. Half and hour later, I stepped outside again and the car was empty. Blinded by the blazing sun, I scanned the lot for signs of dogs. Eventually, I rounded the corner of the building and there was our new pack, sitting in the grass in a shady spot with Papa. Duncan fit right in. His little face just beamed. This was a grand adventure! That afternoon was filled with new experiences. Emma was thrilled with her new toy, but puppy was tired. We weren't concerned. He'd had a big day, after all. The next day was filled with potty outings, shredding garden plants and running after - and from - Emma. Finally, I deposited an exhausted pup on Papa's lap and announced it was "me time" for Mama. Typing merrily away at my keyboard, I was suddenly yanked back to earth by wails from the living room. Papa had fallen asleep with Duncan on his stomach. Now Duncan had scrambled up on Papa's face and was clinging to his glasses, smothering him. Duncan seemed in a panic. I pried him off Papa's face and ran outside. He hit the ground running, then stopped and ... exploded - noisy projectile diarrhea and even noisier puppy shrieks. Figuring it was stress and ingested plant material, I put him to bed early. The vomiting began at midnight. I had the crate and the pup and my pajamas almost clean by the time it re-visited at 2AM. On and on it went. By 8AM, I was on the phone to the vet. Since my regular vet was out of town, the breeder had given Duncan his second Parvo booster before we brought him home. It was a few days early, but Parvo was rampant in the breeder's part of the state so we wanted to take no chances. Now, here I was at 9AM, and the alternate vet was saying, "that's a Parvo puppy alright". Our best guess is that he'd been exposed (probably at the breeder's vet clinic) and the second booster put him over the edge. He might get worse, dehydrate and die. He might have a mild case. He might not have Parvo at all, maybe some virus that the whole pack would catch. All we could do was treat the symptoms and hope. Everything was now touch and go. The vet suggested installing an IV in his tiny leg just in case he needed intravenous fluids later. If he became dehydrated it would be nearly impossible to find his little veins later. Turns out it was already difficult. He accepted several pokes and then began to SCREAM. It sounded like an ambulance siren - only louder. Vet Techs came running in. He screamed until he couldn't breathe anymore and the vet started blowing air into his nostrils. Finally, my bandaged baby was handed back to me with a pile of medications. We'd done all there was to do for now. If he continued to vomit he'd end up in intensive care. Back at home, I set up a puppy hospital in my office. Every 2 hours he was to drink a tablespoon of a special fluid used to re-hydrate human babies with similar problems. After handling Duncan, I peeled off my vomit stained "puppy clothes" and put on my "big dog clothes", then scrubbed with antibacterial soap. I worked at my computer with Duncan wrapped in a towel in my lap. The vomiting slowed. The next morning the vet felt we were making progress and allowed me to offer a tiny amount of cooked rice every few hours. Emma and Arthur snorted at the door to the makeshift hospital. Everyone anxiously waited. Just when the first round of vet visits were over, it was time for puppy shots, round three. Duncan froze when he saw us headed toward the car. I coaxed. I dragged. I got down on my knees. He was adamant - there was nothing but terror for puppies at the end of a car ride. My happy, carefree pup had transformed into "Weenie Man", worried and fearful. Running low on time and energy, I picked him up and tossed him in. On the way home from the vet's office, I decided to remind the boy that the car could also take you to nicer destinations. Time to do some emergency repair work on his damaged psyche. I stopped at the local pet shop to let Duncan do some shopping. They keep a lot of squeaky toys in low bins for easy dog selection. Duncan now refused to get out of the car. "Here Puppy, Puppy", I chirped in the perkiest voice I could muster. "No thank you", said Duncan's timid expression. I took the leash and "ran" two feet. It went taut. I couldn't activate his chase reflex. Minutes dragged by like hours as I pleaded with the terrified pup. Finally, he obliged and scurried onto the pavement. I was praising him when he disappeared beneath the car, pulling the leash tight under the wheel. Now he had Mama on all fours, mooning morning traffic on a busy road...talking to her tire. "Hey, Babycakes, don't you want to go shopping with Mama? Nice treats in the store, Sweetie". Babycakes would not be fooled. The car led to needles - always had. He would not be moved. Somehow, I managed to free the leash from the tire and drag him out. We had slid down a peg on the happy scale. My efforts to make his doggy day had only terrorized him. Once inside, the lovely smells reassured him somewhat and he chose several amusing toys from the bins. Then he lounged on the counter while I wrote the check. Progress was made that day...the hard way. Since puppies require about 3 million booster shots before they have their adult teeth, I made sure the next trip to the vet also ended at the pet shop. This time we went to the pet "super store" to load up on dog food and toys. Now, normally this store sends the canines into doggie ecstasy - the admiring fans, the food piled ceiling high - it's heady stuff. 20 feet into the store I stopped to load the cart and Duncan promptly fell asleep on the floor beside the rawhide bins. I tugged the leash. I called to him. He was out cold. Bewildered, I picked him up and set him in the cart. His head was resting on a large rawhide bone. I made my rounds and loaded the cart around him. People laughed and pointed as the amazing snoring shopping cart rolled by. Duncan slept through it all. The cashier grinned as we wheeled in and I carefully removed his rawhide pillow. He looked up, bleary eyed, took the treat she offered and then dozed off again. Duncan had fooled us all. Our fearful little "Weenie Man" was now embarrassingly mellow. Just a few months later, we loaded the pack in the car for Duncan's first vacation. We drove 4 hours north to Alpena for the annual Lighthouse Festival. 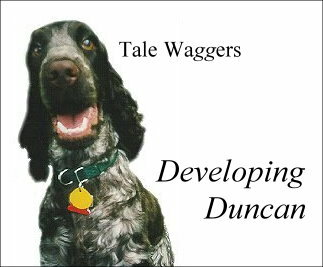 Duncan was tentative. He had to be inserted into the car. The two veteran travelers took to their bucket seats leaving him to pace and whimper. A series of stops at unfamiliar scenes made him bit more nervous about what might be in store. He took it in stride, but we could tell he was concerned about where this was all leading. The next day, Papa announced we were all heading even further north for a pig roast at one of our favorite lights. Duncan had never walked with the pack before. Normally, Emma headed out like the leader of a team of Huskies at the start of a run while Arthur dawdled behind - sniffing, tracking, marking. Mama ended up in the middle like a wishbone about to be snapped. Now Duncan was added to the equation. He alternately bolted forward and hung back in fear. As a result, he was able to trip all three of us at every step. Papa immediately disappeared into the lighthouse tower, leaving me to slowly make my way along the beach with the three dogs in tow. Arthur fell over. Emma tripped. Duncan tried to scale the sides of the seawall in a panic. Exhausted, we struggled back to the picnic area. Now Duncan began to see the real benefits of Cockerdom. Children appeared from all sides - "can I pet your dogs?". All three were lavished with affection. Then the parents came looking for the kids and they brought scraps of pork for the "adorable" doggies. Duncan was beside himself with joy. He made a connection - people were FUN! You could have a world of fun - and pork too! Everything changed that day. Now Duncan was the one charging at the end of the leash - "Let's go, let's go! I see more people ahead!". And so it came to pass that Duncan went from a calm infant to "weenie man" to "Mr. Mellow" in the space of just a few months. I'd like to say we had something to do with it. I'd like to hope we did. In any event, we made the journey together and that's what counts.